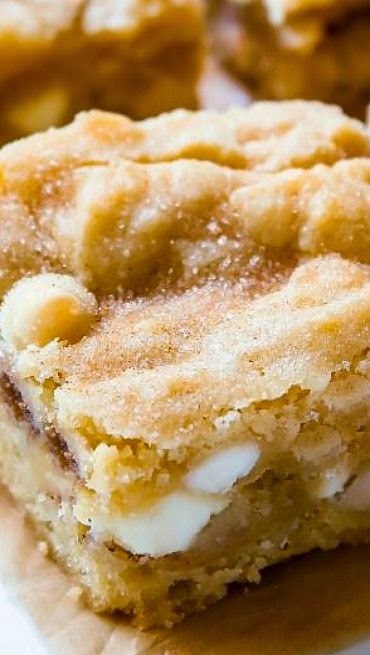 White Chocolate Snickerdoodle Blondies | FoodGaZm..
A cross between a chewy blondie and moist butter cake, these blondies are studded with white chocolate chips and ribboned with sweet cinnamon sugar! I made these yesterday as a thank you token for a friend. I found them very easy to make, with the added benefit of not having to buy a lot of ingredients not already in any kitchen pantry. They were a delicious hit with the added bonus of my husband unable to stop eating them. He isn’t usually that interested in sweets..